As apple season comes to an end in my neck of the woods there is no shortage of tasty dishes to prepare and enjoy these seasonal treats. This recipe is super easy to make and the best part of the dish is you can use items most kitchens have on hand. One rule to follow is to always use fresh firm apples. Add this Almost Apple Pie Recipe to your collection. 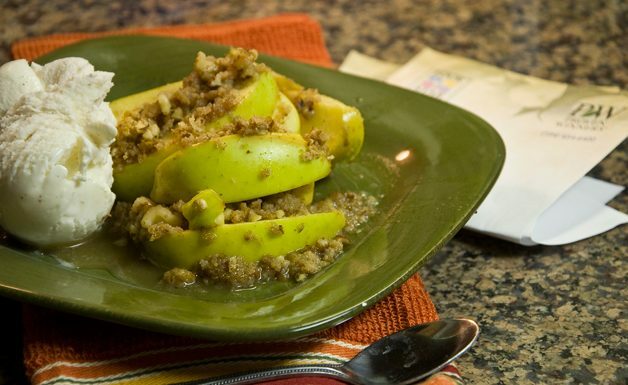 Combine apples, apple cider, 1/2 brown sugar, vanilla, 1/2 teaspoon cinnamon in a large skillet over medium-high heat. Cook, stirring occasionally until apples are tender but NOT soft (about 15 minutes) Stir in 1 tablespoon butter until melted, remove from heat and transfer apple mixture to a pie plate. Process bread in food processor or hand chopper until crumbs are formed, about 15 seconds. Melt remaining 1 tablespoon butter in the microwave for 20 seconds. Toss crumbs with melted butter, walnuts, remaining 2 tablespoons brown sugar and remaining 1/2 teaspoon cinnamon. Scatter crumb mixture on top of apples and bake for 45 minutes, until topping is crisped and lightly browned. I would love to hear if you made this recipe I featured in today’s post. Be sure to leave me a detailed message on my contact page located on my site.